After reading, discussing and analyzing the trends in practicum observations among colleagues, I have identified several useful strategies to gather information about students and their learning before a new unit, term or school year. From an academic standpoint, many teachers used diagnostic or before-instruction assessments to gauge students’ prior knowledge and learning styles. For example, math and reading assessments were frequently mentioned, as well as “What I did last summer” writing assignments. While these assessments can be very useful to the teacher and can inform instruction practices, it is important to remind students that they are for planning purposes and should not be viewed as tests. They should be supplemented or triangulated by observations and student-teacher interactions as well (Ontario Ministry of Education, 2010). “Bag of 5” activity, where all learners (including the teacher) present 5 items that represent something about themselves. You can find some great ideas for getting to know your students (and introducing your subject) at Teach Hub. One of my colleagues described a particularly unique strategy and I would add her “My Brain” activity to my toolkit for practice. She explained that the teacher conducted a basic lesson on the areas of the brain and then instructed students to draw their own personalized brain. I would extend this activity to include a discussion of growth mindset, described by Carol Dweck (2014) as the idea that we can grow our brain’s capacity to learn and solve problems. This brain activity would reveal the personalities and various interests/hobbies of each student (e.g. the teacher could circulate and have informal interactions with students), as students label their “brain” drawing with the different components of their lives and areas of their brain that they hope to “grow” over the year. I believe this would not only communicate the shared belief that all students can succeed (Ontario Ministry of Education, 2013), but would also recognize the unique starting points and patterns of learning for each student. Armed with this insight into the students’ preferences and interests, I (as teacher) would be better prepared to differentiate instruction accordingly. At a deeper level, I would add to my toolkit a strategy that strives to foster a safe, healthy and supportive learning community in the classroom. One such strategy mentioned by a colleague described an open-ended “class banner” activity for the start of the school year. By providing students with the opportunity to come together and decide how they would represent their learning community in banner form (e.g. flags of students’ countries of origin, digital or print format), the teacher transfers ownership of planning (and subsequent learning) to the students. This activity sets the tone for a learning environment that is student-driven, collaborative and inclusive. It would also provide a valuable opportunity for the teacher to make observations about the socio-affective and interpersonal characteristics of students, which could contribute to the creation of a class profile (Ontario Ministry of Education, 2013). 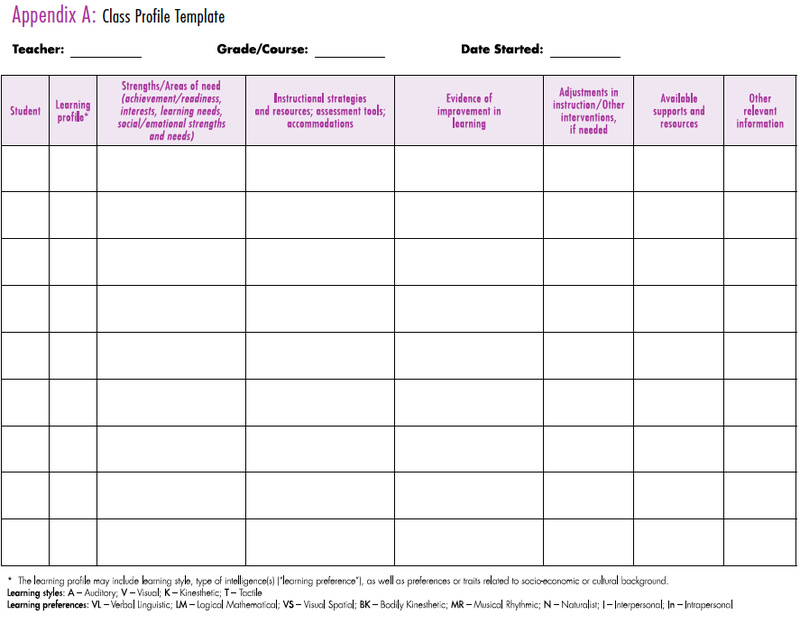 While the class profile is a living document, it can be used to inform planning, instruction and assessment for all students. I think these types of activities go a long way in helping a teacher to become acquainted with the learners in his or her classroom at a personal level. Furthermore, they help students to understand each other better and they work to create a learning community characterized by mutual respect and support. As emphasized in the Ontario Ministry of Education’s Learning for All (2013) document, every student has unique learning and motivational needs, and the teacher has a responsibility to put the learner at the centre of assessment and instruction practices.